Sorry I haven’t posted in a while! I’ve been keeping busy! 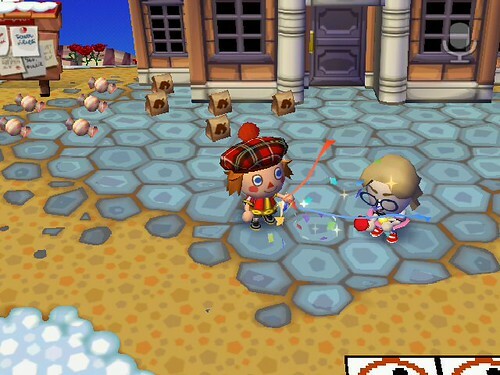 But that doesn’t mean I haven’t been playing ACCF, of course. In fact, I have even been WIFI’ing a little bit more than usual! 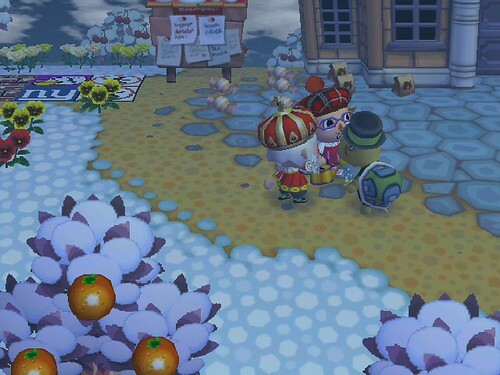 At the end of January, my [real life] younger sister and I played AC together! 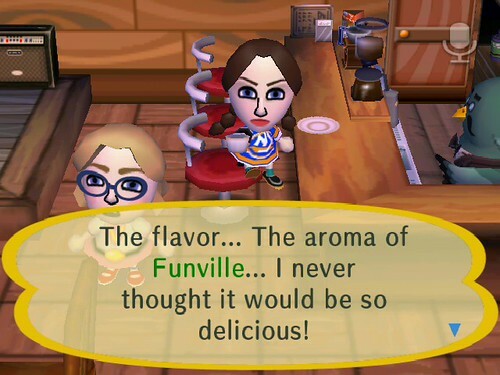 She’s new to the game and doesn’t know much about it, so I reluctantly gave her my ACCF Guide! lol Her name is Rachel, and she visited Shaolin, where we set off party poppers during the grand tour! Since then, things were pretty quiet in Shaolin through the end of January. The Northern Lights appeared a few nights ago, so that’s always fun! 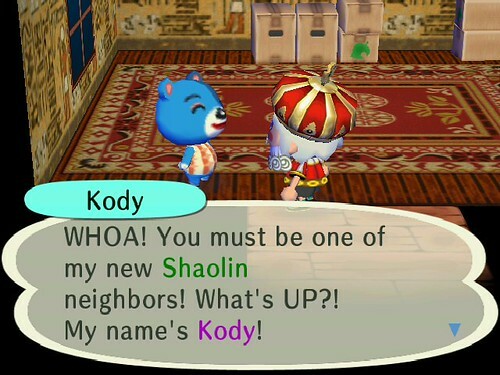 Shaolin has a new resident, too. He moved into Victoria’s old spot, which is a pretty boring location. But I don’t mind it. 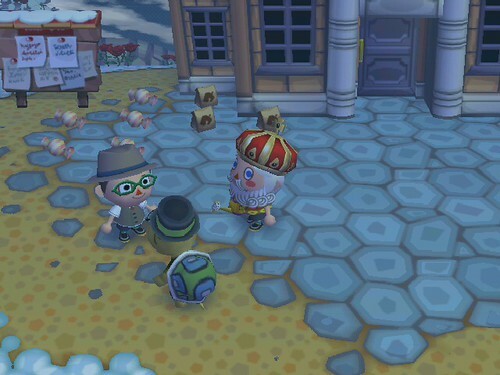 It’s the new animal that I don’t much care for. 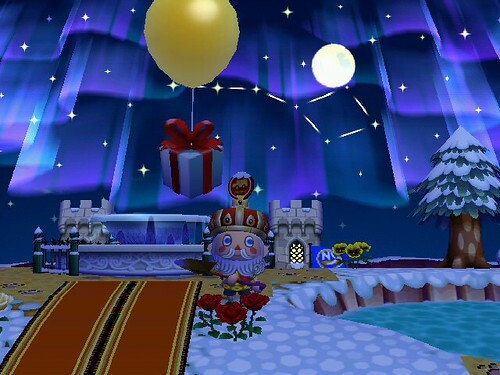 Anyway, when February rolled in, it was time for a new HOLIDAY! If you can call it that. Groundhog’s Day isn’t exactly a ‘hootenanny’, as Puck would say. But nonetheless, my buddies in Japan wanted to come by and join in the festivities! Orenji in a tam o'shanter! And before I go, I’d like to let you know what DLC is coming up soon! 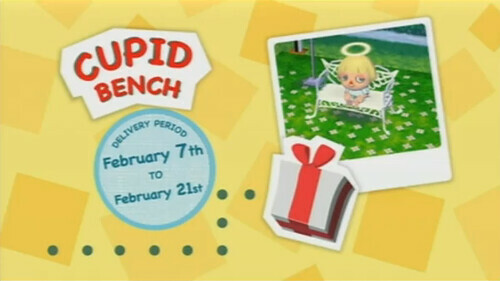 First, in the US, we will be receiving a Valentine’s Day themed item: the Cupid Bench! I hope you find it somewhat useful, despite the errors! I didn’t know we had a DLC coming up. It actually looks cute! Much better than the pile of leaves or the hat chairs. But we do seem to be getting a lot of chairs. Is that all we do? Sit around? Tee hee, you both really look like sisters xD.